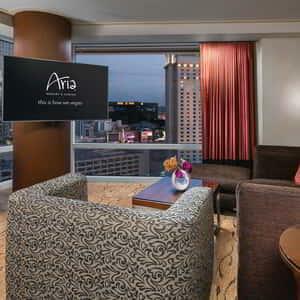 If you would like to add this package on any existing Tower Suites reservation please contact Tower Suites at 702.590.9776 or email us at towersuitesconcierge@aria.com. The Tower Suites VIP Arrival Experience is only available for Tower Suites room types. 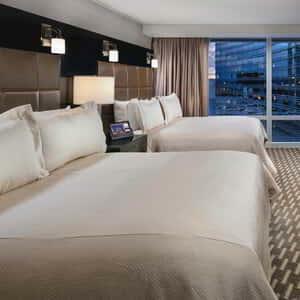 To view all Tower Suites room options visit the Tower Suites room page. - Luxury Airport Transfer will be arranged prior to your arrival. Tower Suites Concierge will contact guests via the phone number or email address provided on your reservation. Luxury transportation options may include limousine or luxury SUV. 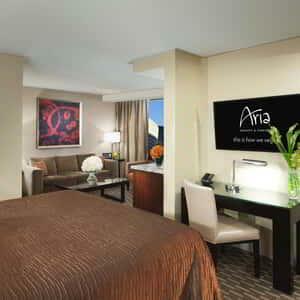 Vehicle type is determined by ARIA Resort & Casino (ARIA). Transportation includes arrival from McCarran International Airport to ARIA and departure from ARIA to McCarran International Airport. - Welcome Cocktail at Lobby Bar for two (2) includes choice of Moët Champagne, Blood Orange Cocktail (Effen Blood Orange Vodka, Fresh Blood Orange Juice, Solerno Blood Orange Liqueur), or Chocolate Cocktail (Stoli Razberi Vodka, Kahlua Mocha Liqueur, Whipped Cream). No substitutions. Guests will receive a voucher upon check in. Voucher is not redeemable for cash, is non-transferable, may not be replaced if lost or stolen and may not be used in conjunction with any other coupon, discount or promotion. Coupon is void if altered, deface or copied. - In-suite American Breakfast for two (2) is valid for two (2) single orders of The In-Room Dining American Breakfast offering. The American Breakfast includes two eggs any style, choice of bacon, ham or sausage & hash browns, in addition to your choice of toast or English muffin. Beverage includes choice of fresh orange or grapefruit juice, coffee, decaf, tea or milk. Order may be placed via in-room tablet or telephone. Value includes breakfast, tax and delivery fees. Tip is not included. No substitutions. Value is not redeemable for cash and may not be transferred. - In-suite Welcome Amenity is delivered to room after check-in. Amenity is determined by ARIA and may not be substituted or redeemable for cash. Relax in style and enjoy views of The Strip in this 840-square-foot escape. 920 feet of floor-to-ceiling glass that draws you into the vibrant Las Vegas Skyline is what Vegas nights are made of. 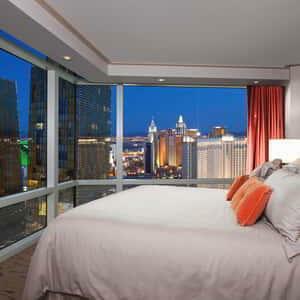 Stay in and enjoy the Vegas view in this 920 square feet suite. Relax in style in 1,000 square feet of separate contemporary living and bedroom spaces.